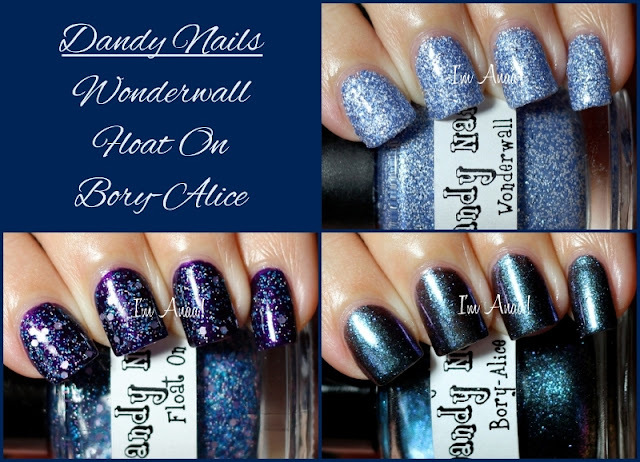 Wonderwall - periwinkle and white glitter in a clear base. I applied 3 coats for full opacity. It can also be used as a glitter topper. Float On - white, pink, purple and blue micro glitter and lavender hex glitter in a clear base. I applied one coat over Illamasqua Baptiste. Bory-Alice - blue/purple shifting shimmer in a dark base. I applied 3 coats for full opacity. Dandy Nails nail polishes can be purchased on Etsy, and for international ladies like me, they're also available on Ninja Polish!